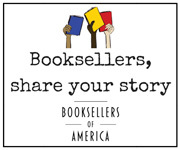 Booksellers have the opportunity to meet with small and mid-size publishers for informal conversations. These publishers, many of which are first-time ABA event sponsors, will have sample copies of their books, as well as additional copies for giveaways at their discretion. See the list of Meet the Presses participants here.